We would like to introduce our education birds. These birds and their handlers provide a valuable service to all that come into contact with them. Our education birds will visit any venue they can and all our bird handlers give willingly of their time to talk to people about birds and our group. We do not charge for our programs. 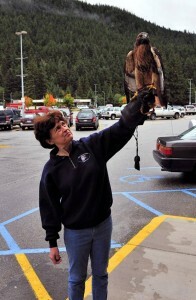 You are welcome to contact us via email: info@juneauraptorcenter.org to request a program. If you do this via email, it’s good to have at least two weeks advance notice, how many people in the group, participant ages (if the program is for younger children) and how much time is requested for us to be there. It’s also good to know which bird is being requested or if any bird is acceptable! Many of our bird handlers work Monday through Friday, 8AM – 5PM, but we will always be as accommodating as possible. You’re also welcome to call and request a program via our message phone: (907) 586-8393. 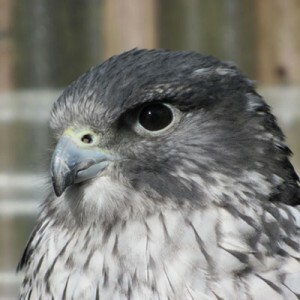 Phil is an adult gyrfalcon born in 2006. He became a JRC education bird in 2006. He was found in the Yukon Delta by U.S. Fish and Wildlife (USFW) researcher Travis Booms as a fledgling. Travis was studying nesting habits of gyrfalcons. This bird had been one of three siblings in the nest. The other two siblings were feathering out normally but Phil did not seem to grow any tail or wing feathers. After long discussions with USFW and having obtained the correct permits and permissions, Travis collected Phil from the nest. Phil stayed with him for three weeks out in the field. After their return to Anchorage, the bird was cared for by the Anchorage Bird Treatment and Learning Center (Bird TLC). Bird TLC conducted multiple tests on Phil to attempt to determine why he failed to retain any feathers necessary for flight. The end analysis was that it is either an autoimmune problem or a genetic abnormality. Bird TLC then asked JRC if we would like him as an education bird and when all the necessary paperwork was finalized, Phil was placed with JRC. Phil is very social, unafraid of humans and this makes him an ideal education bird. The brilliant summer sky was blocked by a broad shadow and rapidly descending, grasping yellow feet. As the parents screamed in alarm, the raven chicks huddled in their nest, ragged pink mouths calling helplessly into the air. The eagle swooped away, talons empty. Its target, the biggest chick, lay on the pavement 40 feet below the nest. The chick’s wings, though fully feathered, were not yet capable of lifting him into the air and he could only wait for fate to bring him rescue or death. “Blueberry,” as we named the chick (for his deep blue baby-raven eyes), was about three weeks old when he arrived at the Juneau Raptor Center. Hatched from an egg about the size of a domestic chicken’s, he was already close to full-grown. We were able to pin his fractured left leg and the fix “took” – a month later Blueberry was good as new. Ravens are among the smartest animals in the world – they can solve puzzles, play games, manipulate other animals’ (including humans’) behavior, and they have a sense of humor. However, as intelligent creatures, they need to learn a lot to prosper. Parents continue to mentor juveniles for several months after they leave the nest and family and flock are critical to a healthy, long life. Blueberry missed baby bird school and he was unable to fend for himself when we released him. After the fourth release and eventual return to JRC, we decided Blueberry’s best prospects were as an educational bird. Blueberry is an active participant in educational presentations. 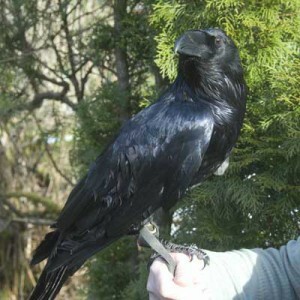 He vocalizes, sometimes using human-speak, “How are you?” makes a variety of raven calls, and provides a few antics. While at home, he’s often visited by other ravens in the downtown Juneau flock, especially the pair that nests each year in the nearby forest. In addition to his favorite foods (hard boiled eggs, watermelon, beef bones, raw quail – and, yes- blueberries! ), we provide a variety of toys and activities to keep him challenged and entertained. In May of 2006 Lady Baltimore was found injured on Juneau’s Douglas Island. She had been shot in her beak and the wrist of her right wing. Also, her left eye is completely blind from a detached retina . The impact of the bullet through her beak may have been the cause of the detached retina. With only one working eye, she doesn’t have depth perception. Because of this, she has a tendency to run into things and wouldn’t be able to hunt for her own food in the wild. The injury to her wing prevents her from achieving lift above six feet into the air. She is not releasable to the wild because these injuries are permanent and she would not survive on her own. The poacher was never caught. It is estimated that Lady Baltimore was on her own for about two weeks with these injuries until someone found her. The reason for this estimation is due to her weight. She was about six pounds when she was found, where she is now about eleven pounds. She was originally thought to be a male because she was so light. Therefore, her name originally was Lord Baltimore. – Her age is unknown because she was already a full adult when found. We haven’t bothered to ask her what her age is because it’s not polite to ask a lady her age. – Her wingspan is 6 1/2 feet wide. – Her favorite part of a salmon is the head. – She’s very talkative. When she sees or hears her caretaker(s) after a bit of time, she calls to us. She does this even if she has food. – She is very calm around large groups of people as long as they are calm and quiet. When she gets annoyed with people using flashes or making noises at her to get her to look, she will turn her back to them, or on rare occasions hides in a corner where people can’t see her. -In the last few years, she has become so comfortable being around the public, she will nap in front of visitors, especially towards the end of the day. Some days she will even come to her front perch and sit inches from the guests. This has become quite the selfie opp for many travelers. I’ve been told she is quite feisty toward the other eagles. 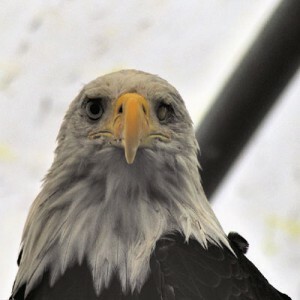 In April 2000 the Juneau Raptor Center responded to a call about an injured adult bald eagle. It’s thought that this bird was in a fight with another eagle resulting in a severely damaged right eye. After extensive treatment and a visit to a Juneau ophthalmologist, the prognosis for this eagle was not positive. Diagnosis: irreversible blindness. Blindness in one eye won’t rule out releasability as long as the eagle can demonstrate the skills to survive in the wild such as being able to fly from the ground up into a tree. Justice wasn’t able to do this. He is debilitated in such a manner that when flighted he flaps in low circles, never achieving a straight line. It didn’t take long to assess him as being a excellent candidate for becoming an education bird that travels with his handler to schools and other educational functions. 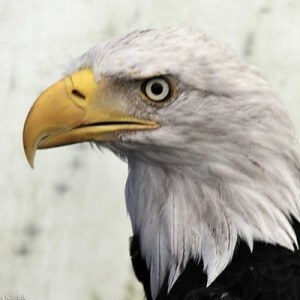 This allows people to get a rare, close up view and learn more interesting facts about eagles. Justice is an excellent example of a typical adult male bald eagle both in temperament and size. You probably wouldn’t guess just by looking at him that he weighs in at 8.5 pounds. He loves fish heads and upon seeing one will immediately head into his travel kennel to have this treat! August 18, 2010 update: Adult bald eagle/education bird Justice was transported today to the flight mew to “train” the baby. Justice looked around and immediately started stealing the baby’s food! The baby went to Justice as soon as we let Justice out of his kennel and cried and cried. Justice was more intent on his food and kept flying from perch to perch to get away from the baby, but the baby would follow. The baby was trying to figure out how to get up on the perch to be with Justice. We’re glad to see the baby is now getting onto slightly higher perches!